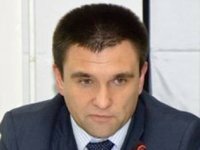 Ukrainian Foreign Minister Pavlo Klimkin has extended his condolences to the relatives of the people killed in the explosion that occurred in the St. Petersburg metro on Monday. "We are working to determine whether Ukrainians have been hurt in St. Petersburg. I extend my condolences to the victims' families and the people who have been hurt," Klimkin said on Twitter on Monday.